For those who want to cash in on the value built up in the home over time, the FHA cash-out refinance is an important option to consider. Be prepared for a new credit check and request copies of your credit reports. Then examine your FICO scores and your credit history carefully. Borrowers who want to refinance to get lower mortgage payments often turn to an FHA Interest Rate Reduction Refinance Loan or FHA IRRRL. But for those who want to cash in on the value built up in the home over time, the FHA cash-out refinance is an important option to consider. Applying for a cash out refinance loan can seem very familiar to home buyers--there are similar credit considerations, there are closing costs associated with the loan, and there will be an appraisal required. Budgeting and saving for the closing costs and the appraisal are important, and like a new purchase FHA mortgage you’ll want to give yourself plenty of time to prepare, check credit, and save money. And that brings us to the first step--figure out how much time you need to prepare for the loan. The previously mentioned budgeting and saving are important and if you wish to purchase discount points on your cash out loan you can pay for them up front with reduced impact on a monthly budget--if you take enough time to save up in advance to pay for discount points. You can work with a lender to determine how much you would need to pay in order to purchase discount points on the new loan. The credit check is problematic for some applicants if they haven’t got a full 12 months of on-time payments on the existing mortgage and other financial obligations. Be sure you have this full 12 months of on-time payments before you apply for best results. Never apply for cash-out refinancing with a late or missed mortgage loan payment in the last 12 months. To be fully prepared for a new credit check, request copies of your credit reports. Examine your FICO scores and your credit history to insure there are no errors or outdated information. Request your credit reports from the three major credit reporting agencies: Equifax, TransUnion, and Experian. This is a task you should do far in advance of your new loan--if you need to dispute or otherwise correct a credit report, you will need time to do so, and checking four to five months ahead of your loan application may not be enough time to settle disputes or have corrections made. FHA cash out refinance loans aren’t just for existing FHA mortgages--an FHA cash out refinance loan can be taken out on existing FHA loans and non-FHA mortgages alike. 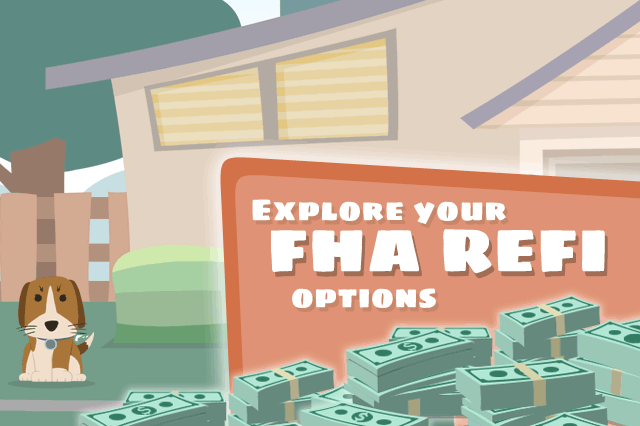 You may find refinancing to your advantage in the case of non-FHA mortgages thanks to lower interest rates on FHA loan products than conventional mortgages. That’s an important option to consider before deciding on a lender and a refinance loan package.